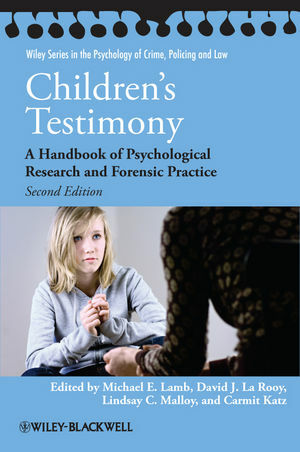 The second edition of Children’s Testimony is a fully up-to-date resource for practitioners and researchers working in forensic contexts and concerned with children's ability to provide reliable testimony about abuse. Michael E. Lamb is Head of the Department of Social and Developmental Psychology at the University of Cambridge, UK. David J. La Rooy holds a Research Lectureship funded by the Scottish Institute for Policing Research at the University of Abertay Dundee, where he is responsible for the Forensic Psychobiology Degree. Lindsay C. Malloy is Assistant Professor of Legal and Developmental Psychology at Florida International University, US. Carmit Katz is Research Associate in Applied Developmental Psychology at the University of Cambridge, UK. 1 Developmentally Sensitive Interviewing for Legal Purposes (Lindsay C. Malloy, David J. La Rooy, Michael E. Lamb, and Carmit Katz). 2 Setting Realistic Expectations: Developmental Characteristics, Capacities and Limitations (Michael E. Lamb, Lindsay C. Malloy, and David J. La Rooy). 3 The Development of Memory in Childhood (David J. La Rooy, Lindsay C. Malloy, and Michael E. Lamb). 4 Assessing the Competency of Child Witnesses: Best Practice Informed by Psychology and Law (Thomas D. Lyon). 5 Planning the Interview (Kevin Smith and Rebecca Milne). 6 Rapport Building in Investigative Interviews of Children (Irit Hershkowitz). 7 Practice Narratives (Kim P. Roberts, Sonja P. Brubacher, Martine B. Powell, and Heather L. Price). 8 Investigating Substantive Issues (Yael Orbach and Margaret-Ellen Pipe). 9 Reviewing the Case (Post-interview) (Trond Myklebust and Gavin E. Oxburgh). 10 Managing Children’s Emotional and Clinical Needs (Kathryn Kuehnle and Mary Connell). 11 Training Forensic Interviewers (Heather Stewart, Carmit Katz, and David J. La Rooy). 12 The Use of Supplementary Techniques in Forensic Interviews with Children (Deirdre A. Brown). 13 Children with Intellectual Disabilities and Developmental Disorders (Lucy A. Henry, Caroline Bettenay, and Daniel P.J. Carney). 14 Evidence and Cross-Examination (John R. Spencer). 15 Children’s Disclosure Statements as Evidence in the United States Legal System (John E.B. Myers). 16 Consequences of Legal Involvement on Child Victims of Maltreatment (Jodi A. Quas and Mariya Sumaroka). 17 Expert Testimony (Bryan Tully). 18 Relationship between Research and Practice (Graham M. Davies and Lindsay C. Malloy). 19 Child Protection Considerations in the United States (Richard J. Gelles and Rebecca Brigham). 20 Facilitating Effective Participation by Children in the Legal System (Lindsay C. Malloy, David J. La Rooy, and Michael E. Lamb). Appendix: The National Institute of Child Health and Human Development (NICHD) Protocol: Interview Guide.